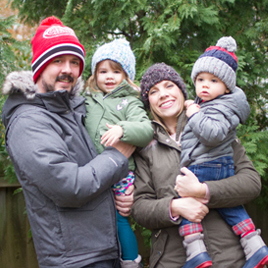 In our quest for the perfect kitchen, one big decision was what kind of counters we wanted. We didn’t know too much about counter materials. Going into a place like Home Depot and seeing all the counter options didn’t really help us either. 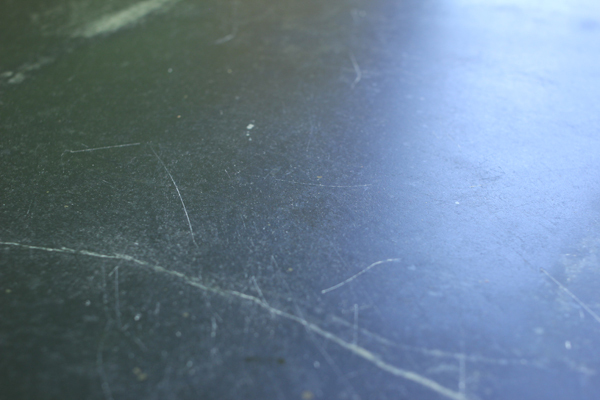 Quartz, granite, slate … I don’t know, everything seems the same to me. 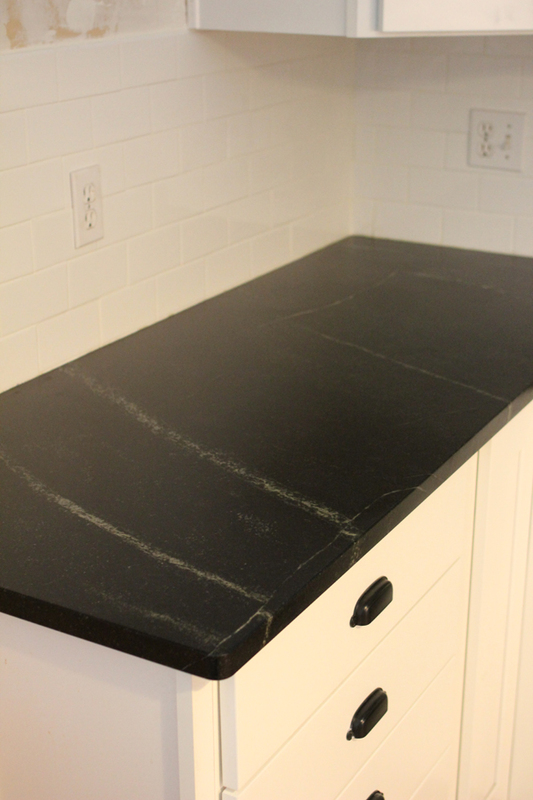 It kind of came down to two things for us: one, we knew we wanted dark counters, and two, we wanted something that was a natural stone. Other than that, we honestly had no clue what was what. So we did a bunch of research on what was good for us. We knew we wanted low maintenance (some natural stones require you to treat them every few months). 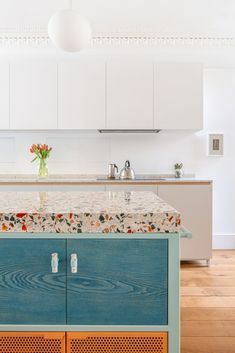 We also wanted something that wasn’t super delicate, meaning, we don’t want to have to tip-toe around our counters, and not put anything on them ever. 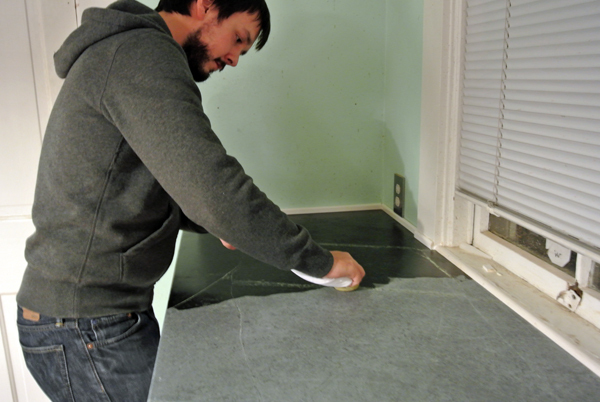 After looking at the pros and cons of different materials, we saw soapstone on TV actually. It was super dark black and looked awesome. We looked into it online and it seemed to fit our profile perfectly. It needs to be treated with mineral oil or wax when you first get it (if you want to darken it), but then only once a year or so. It’s non-porous so it doesn’t stain. 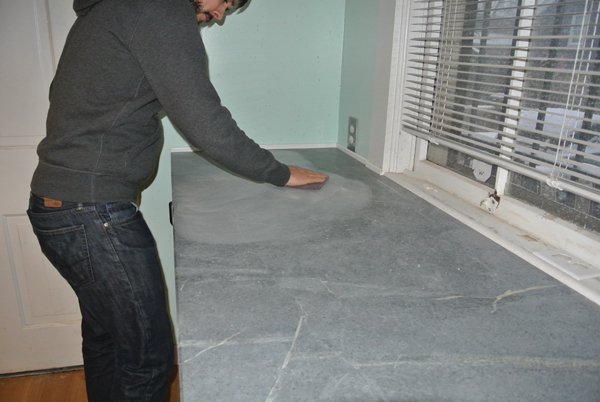 Kerry also found out that soapstone is very era-appropriate for our house. It most definitely could have been the original counters that were here in 1890. So soapstone it was. We were warned of this, but when soapstone first shows up, it’s grey. It’s not the deep dark color that we wanted. But that was okay. Here’s how it looked when it was first installed. Much more grey than we’d want. 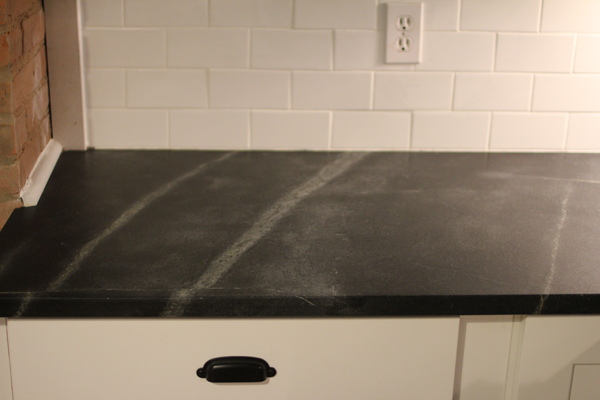 A quick way to tell what soapstone is going to look like when it’s dark is to spill some water on it. It goes away pretty quickly but it gives you a preview as to what they can look like if you oil it. Before we got to the oiling of it, the installers recommended that we give it a very light sanding. We didn’t even use sandpaper for this, you just use the rough side of a dish washing sponge. All we were looking to do is smooth out the surface area. There also were a few spots that were a little … off … in color, and it just took a real light sanding to get them out. After the sanding (and a quick clean) it was time to change that color. The conventional way to do this is to use oil. 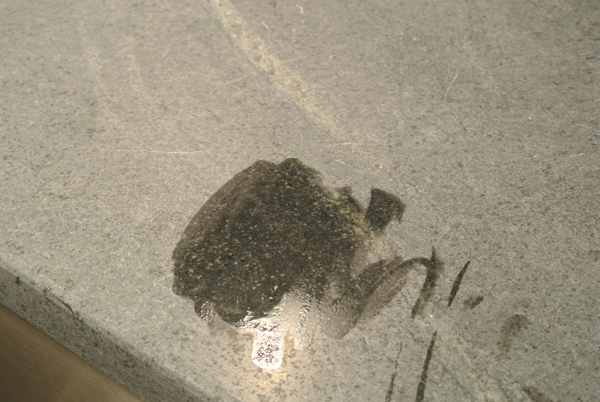 However, the guys who were installing our counters recommended that we look into Dorado Soapstone Wax. The wax had a lot of benefits over oil to us. It gets a deeper, richer color. It requires less coats. And it also has a bit more of a matte finish, rather than a shiny one. That sounded perfect to us. You can see here how different the look is when you start applying it. After the first coat it was SUPER black, but then after a day or two, it started to wear off a little bit. It became apparent which areas didn’t get as much coverage. Some areas were a little lighter grey while others remained the dark color we were looking for. It got a little spotty. It didn’t look awful, to be honest, but we wanted to put on a second coat to see if we could get that darker color to be a little more consistent. After putting on that second coat and then waiting a day or two to see if it would fade, we found that the counters were looking exactly how we wanted them. 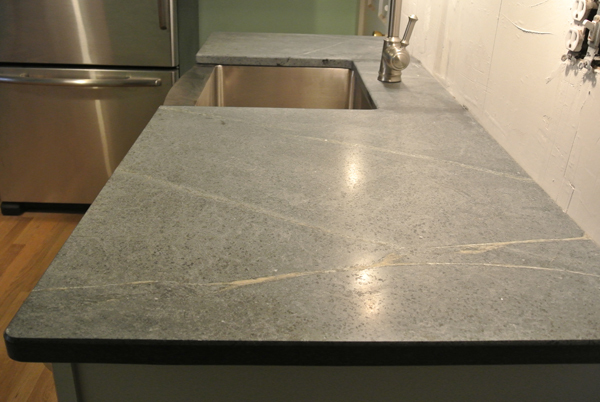 One of the issues with soapstone is that it is a soft stone. It scratches easily. 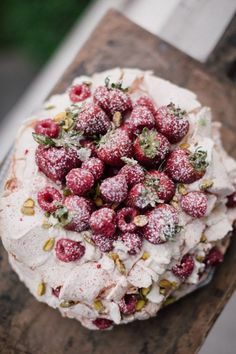 There are two things that make this okay, to us. The first is that, again, we’re looking for a real “natural” look so the scratches don’t really bother us. The other thing that makes it okay is that, if you really hate the scratches, you can just buff them out and re-wax them. They go away pretty easily. In fact, we were told that if you knock a whole chunk off, like a big corner, you can just superglue it back on, buff the seam, wax it up, and it’s good to go. But to us, the scratches just seem to blend in to the natural veins of the stone. Over the course of a few weeks now, the color has varied a little bit. There are a few spots that are a little lighter than others. Kerry ran the Kitchen Aid mixer for like 3 days straight in one spot, and that’s lost a little bit of its color. But to be honest, it doesn’t matter. 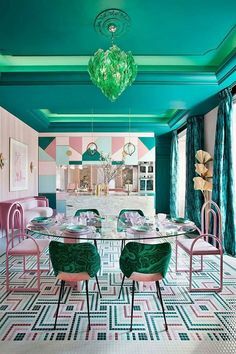 It looks totally awesome, and the variation in color makes it look so real. 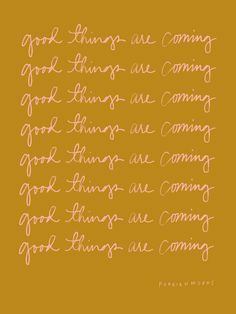 It’s exactly what we wanted.